This project is NOT being part-financed by the Scottish government, the European Community, Dumfries and Galloway Leader programme, Dumfries and Galloway Council, Scottish Natural Heritage, etc. The last thing visitors should see in Dumfries and Galloway is a herd of dying white elephants roaming around the region. If these "cultural" projects were children, Dumfries and Galloway agencies would be guilty of neglect and for failing to give their offspring the tools and skills required for long-term survival and independence. Knee-jerk reactionaries chasing the magical mystery funding train in order to stave off the inevitable end of a delusion should not be continually rewarded. Sometimes the harder path is to actually produce something through organised work, and to try and maintain those things for the benefit of the many. Even if it means taking a punch on the nose when it goes wrong. Scotland has a reputation for creative musicians, artists and wordsmiths (and people who punch people on the nose). It also has a recent history of manufacturing and production. What is being added to this today? 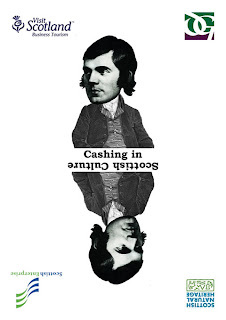 There seems to be a new Scottish culture set to stifle the progress of the Scottish person: talking shops, big boards, planning committees and partnership agencies, funding vehicles, quangos, and channels for laundering tax-payers' money to trickle it back down to the public after the Directors' cut. But only for those who can convince the purse-string holders they can bring visitors to Scotland that will line private pockets. The amount of time, energy, talk and money spent on encouraging people who don't already live here to come here and spend money, or start businesses, is in direct contrast to the growing droves of young people who need to leave to find a life opportunity and whose paths are beset on all sides. How does this serve the long-term future of the people of Scotland and tomorrow's legacy? Concentrate on building an ongoing legacy today. You don't get good milk from a dead cow.